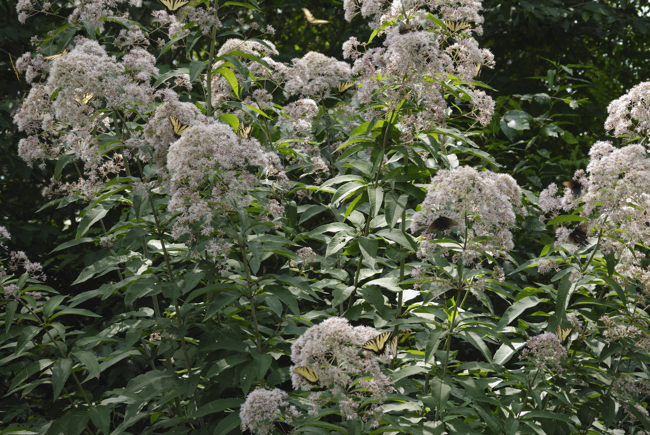 This is my joe-pye weed on August 2, 2010. 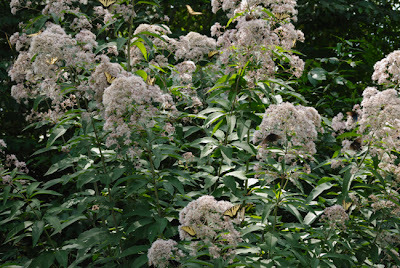 It is in the same stage of bloom today and there was one Eastern Tiger Swallowtail and one Silver-spotted Skipper. I do have two Spicebush Swallowtails and a couple of Pearl Crescents. That is pretty much the whole show. This is without a doubt the worst year for butterflies that I have seen. On the bright side, I have numerous Hummingbird Clear-wings; more than I have ever seen. I do not know what has happened, but something isn't right. There were quite a few tiger swallowtails here this Spring; when the Yellow Poplar was beginning to leaf out. They have since disappeared. I didn't even have very many Cabbage Whites bothering my cabbage and broccoli. I hope they don't return later to devastate my kale. I have seen a couple of sulphurs and a few Least Skippers; fluttering around. There were two Eastern Commas' in the compost pile this morning. I am hoping for a strong late-season performance from the butterflies. I have a lot of milkweed out there; going to waste. You just never know what may show up; anytime or anywhere. 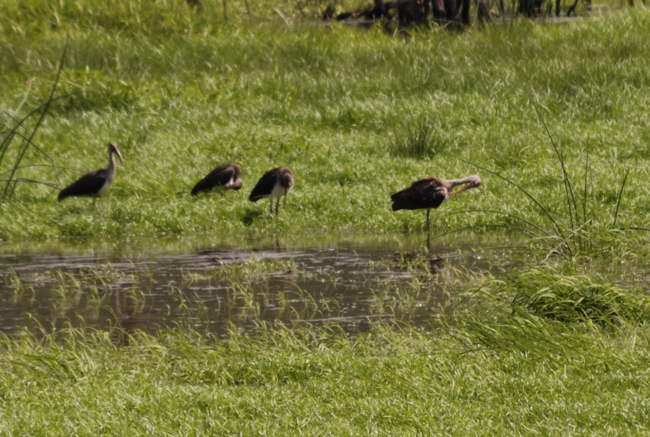 These juvenile White Ibis (Eudocimus albus) are common residents of the Southeast and Gulf Coast. They are found from South Carolina to Texas. 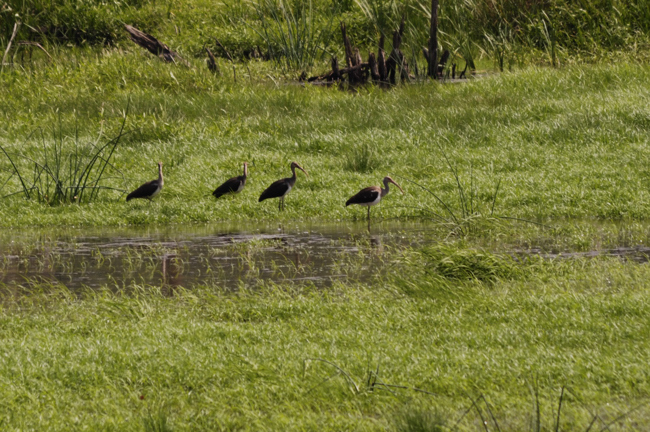 These four youngsters are at Pleasant Creek WMA in Barbour County, WV. The only other ones I have seen were near Charleston, SC in the 90's. I managed to get several photos of these. The terrain limited me to only a couple of angles. the grass was also full of ticks. There was an unbelievable number of dragonflies and damsel flies present at this location, also. 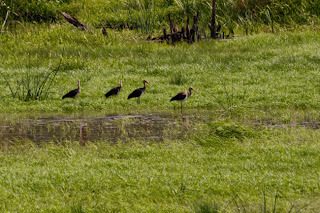 I was there in the early afternoon heat, there wasn't a lot of bird activity. One Solitary Sandpiper was in the foreground of this photo, but was cropped out to see the ibis' better.Other birds of note today were Green Herons and a Yellow-breasted Chat. Photos taken on 7/26/11. I hope I'm sane by the time I'm done. 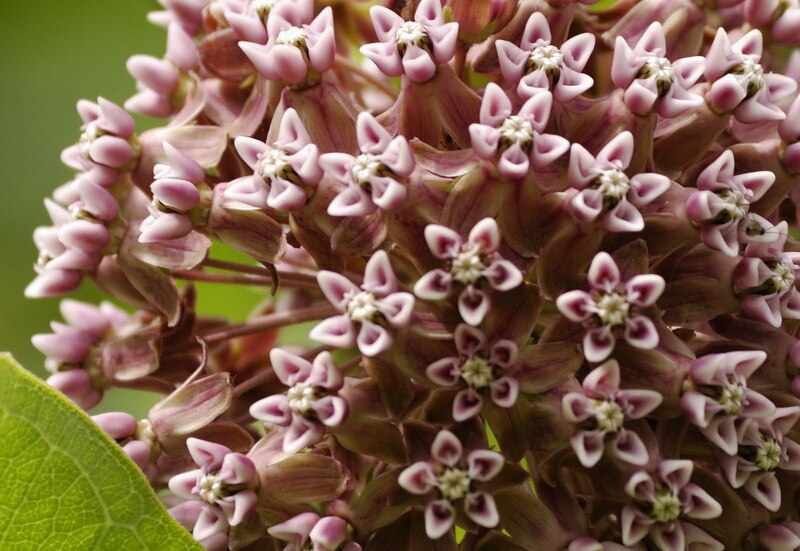 I leave numerous milkweeds around my garden and normally have several Monarch butterflies hatching in my yard. My milkweed is just about finished blooming and I still haven't seen any caterpillar activity. I have only seen 2 Monarchs hurriedly flying through the yard. It sure doesn't look as if we are going to have much butterfly production around here. I did see 2 Spicebush Swallowtails laying eggs on my Sassafras, last week. This has been a slow year for butterfly photography. I sure hope that it picks up as the Summer progresses. I checked out my favorite butterfly/milkweed spot on Backbone Mountain last week and there was nothing present; except for little wasps, bees and flies. 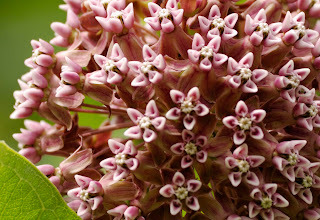 The milkweed was blooming and in normal years; the area is teaming with Monarchs. I guess that we will have to wait and see if anything shows up. I just read that the "hunting" method of baiting; which is so prevalent in our area has been made illegal on public lands, beginning on September 1. It is about time. Somebody somewhere must have had a rod implanted in their spine. Now, I hope that this will be enforced; stringently. What will the Master-baiters do now? I also saw that the statewide squirrel hunting season will open on September 10. I personally do not think this is a good idea. I do not believe that the season will be utilized. It is just TOO hot. It seems to me that squirrel hunting is nowhere near as popular as it once was. Probably one factor is that they can't be baited in and you actually have to utilize some hunting skills. I personally haven't hunted squirrels since 2004; when they cut down all of the trees around here. It was once; something I looked forward to and enjoyed. But; it is hard to justify when you can't just go over on the hill and hunt. Those 50 mile round trips to the woods, add up quickly. The Eastern Comma (Polygonia comma) is a common butterfly of the woodlands and streams. While it may be common; it is equally difficult to photo. It is an erratic flier and rarely holds still; for any amount of time. 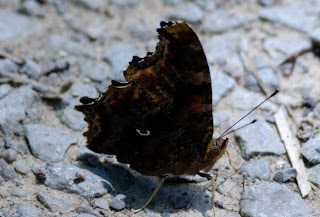 I was finally able to get a good photograph; showing the comma of the comma. This photo is untouched in any way and totally natural. The comma on the wing is as bright as it shows in the photo. This shot was taken on Glady Fork, in Randolph County, WV on 7/6/11. Many of you do not like to admit it; or just refuse to notice, but times are a changing. They are changing quickly , too. We no longer live in our parents or grand-parents world. Things are getting worse; everyday. Do you carry a firearm when you are enjoying your outdoor pursuits? You should. I'm not talking about hunting; either. I am talking about berry-picking, bird watching, camping, hiking and everything else you can imagine. Why ? You are now asking. The bottom line is that you never know what you are going to stumble upon, when you are outdoors. We are not just dealing with Cheech & Chong anymore. You may very easily walk right into someone dumping a body or engaged in a drug deal. Anywhere. Yes, right down at the end of your lane; maybe at the wide spot in the road where you berry pick. You never know. One other thing that you may not be aware of is the fact that West Virginia is an open-carry state. You may carry a properly holstered firearm; unconcealed in most locations. (Be sure to read and interpret the laws on your own). The process for obtaining a concealed carry permit is pretty painless; you can do it. 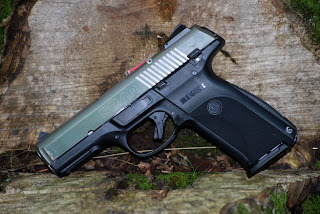 Self defense handguns have evolved greatly in the past decade. There is something out there for everyone. I have pretty much settled on a Ruger SR 40. I went through several models; before I found something that felt good and I could shoot well. It is just a personal preference thing. 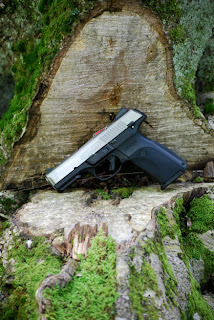 I settled on the .40 S & W cartridge, for the simple reason that it will do anything that I would possibly need a handgun to do. The weight and balance of the Ruger suits me well. If you have been thinking about carrying a firearm; now is the time. Your life may depend upon it. Always remember that law enforcement is an hour away; when you only have seconds. I just spent about 30 minutes outside in my garden and walking the surrounding wood-line. Numerous flowers are in full-bloom, the breeze was calm; but something was missing. I saw exactly zero butterflies. No skippers, no swallowtails, no sulphurs; not even a cabbage white. Nothing ! Something isn't right; I have bee-balm, queen-anne's lace, ox-eyed daisies, black-eyed susans, butterfly weed, butterfly bush and other assorted species blooming everywhere. Not one butterfly. Nothing was to be found except for one single Black & Yellow Lichen Moth. That was it. The bee population seems low to me also. I have a few of the small bumble bees on my tomatoes and I can see about a dozen or so honey bees on the white clover that is my lawn. No great numbers of either. As they would say in Alabama; "something just ain't right". Butterfly Weed is finally blooming ! This species; along with other members of the Milkweed Family Asclepiadaceae are major butterfly attractions; throughout the Summer months. Butterfly Weed or Pleurisy-Root (Asclepias tuberosa) is the most showy species of the family. The flowers range from dark orange to yellow. This beauty can be seen in dry fields and along roadsides throughout the region. It is hard to miss. 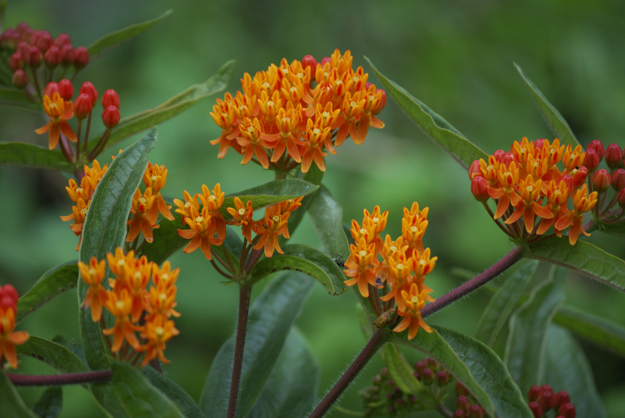 Butterfly Weed and the other milkweeds are an important host plant for Monarch butterfly caterpillars and a nectar source for many other butterflies, bees, bugs and other assorted critters. This standout of the fields cannot be overlooked; I just hope some butterflies show up this year to make use of this pretty plant. Butterflies seem to be present in very low numbers right now. I went out a little while ago searching for a butterfly of the month subject and had little success. 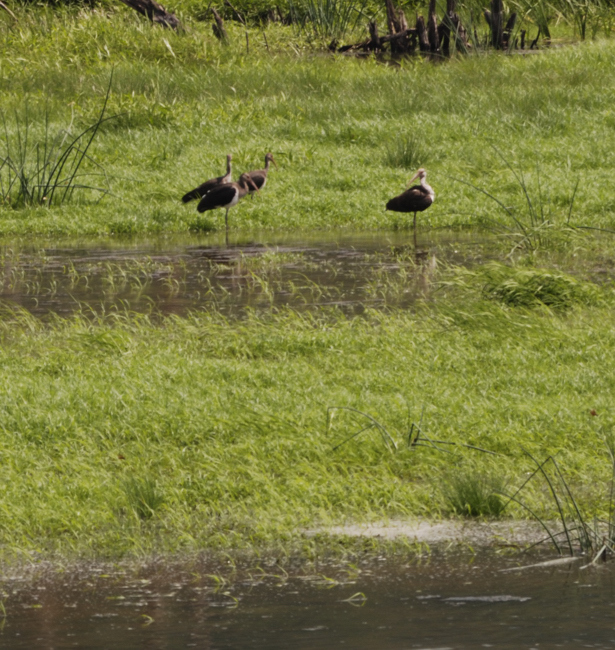 There were a couple of sulfurs rapidly flying around; they presented no photography opportunities. I saw one cabbage white and no swallowtails of any kind. The only species present today in any significant numbers was the familiar Silver-spotted Skipper (Epargyreus clarus) and you had to look for them. The Silver-spotted Skipper is our largest skipper. It is common throughout North America; from Florida to California north to British Columbia and east to Quebec. This species is found wherever black locust is present. It may be found in any open area throughout the High Virginia's. The adult butterfly feeds on a wide variety of summer flowers. The larvae host plants include many members of the legume family. The first brood of butterflies emerge in May and June. The second large brood begins flying in July and has the largest number of butterflies. The final partial brood emerges in August. Therefore the Silver-spotted Skipper should be easy to find throughout the Summer (even the Summer of 2011).